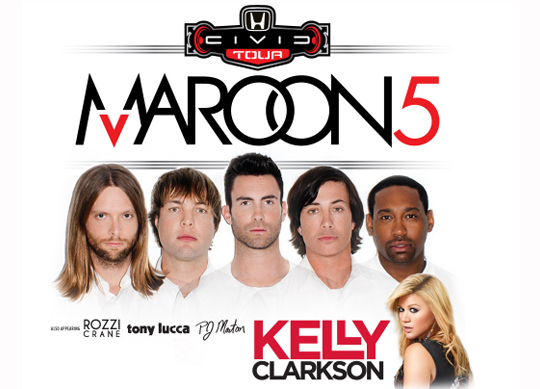 Start your engines - this year's highly anticipated Honda Civic Tour will kick off tomorrow when headliner Maroon 5 takes the stage alongside special guest Kelly Clarkson in St. Louis. The series of shows marks the best selling trek in the tour's 12-year history and Maroon 5's most successful series of US dates ever. In addition to Kelly Clarkson, the band will be joined by PJ Morton, Rozzi Crane and Tony Lucca on select dates (full tour routing below). The Honda Civic Tour, promoted by Live Nation, will make 33 stops across the United States. Adam Levine says "We had such a great time touring the U.S. earlier this year and are really looking forward to getting back on the road with the Honda Civic Tour. We've been rehearsing these past couple of days and we can't wait to spend the rest of the summer with our fans." Continuing a Honda Civic Tour tradition, Honda will present fans with an opportunity to check out a 2013 Honda Civic Si and a CBR250R motorcycle that have been customized and autographed by Maroon 5. The vehicles will be on display at each tour stop, where fans can also register onsite for their chance to win a custom vehicle or a front row flyaway trip to two of the final tour dates. For complete rules and to enter online, please visit Honda.us/M5Civic. Several shows on the Honda Civic Tour are sold out but there are still tickets available for a select number of dates. Fans can check for ticket availability by visiting www.ticketmaster.com. Honda topped all mainstream automakers in percentage of sales to retail buyers during the first five months of 2013, with more than 98 percent1 of the brand's auto sales in the U.S. sold to individual (non-fleet) consumers, based on new-vehicle registration data from R.L. 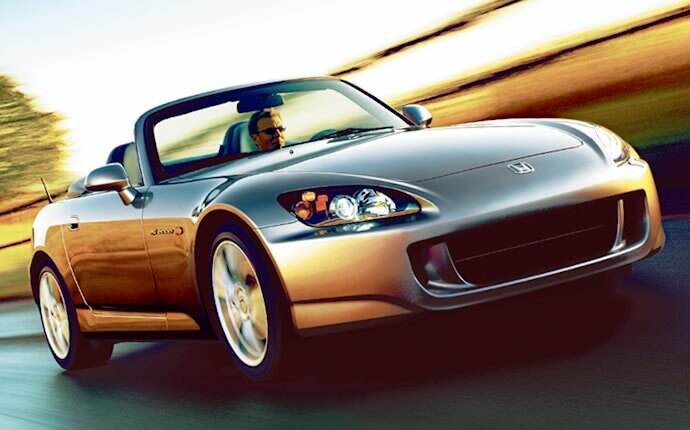 Polk & Co. With a strong focus on providing long-term value and low cost of ownership to its customers, the Honda brand has increased sales by 6.5 percent in 2013 with 668,597 Honda cars and light trucks finding new homes through the end of June. Honda's four best-selling models, Accord, Civic, CR-V and Odyssey, lead their respective segments2 in sales to retail consumers. Together, these segments represent more than 50 percent of all light-duty vehicle sales in the United States. 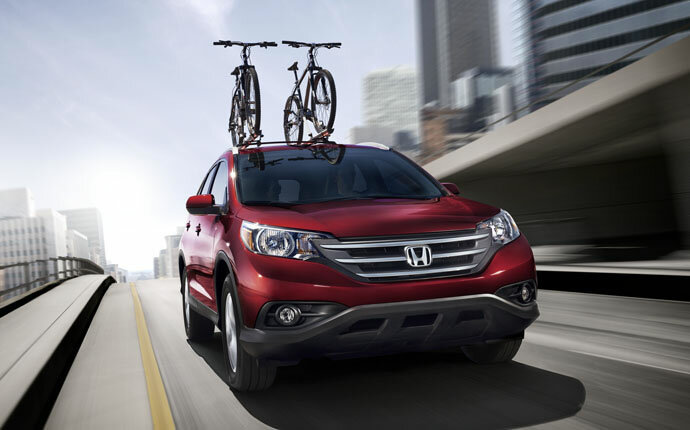 "We're earning our sales growth on the strength of our products and the value they deliver to individual car buyers," said John Mendel, executive vice president of sales for American Honda Motor Co., Inc. "Our strategy is unique among volume automakers, as we are focused on selling vehicles to individual car buyers and not corporate sales to fleets, which is why Honda vehicles have among the lowest cost of ownership and highest resale values in the industry." In the highly competitive mid-size segment, where Accord leads retail sales, many high-volume entrants have sold in excess of 30 percent1 of their vehicles to fleet customers thus far in 2013 while over 98 percent1 of Accords were sold to individuals (non-fleet). 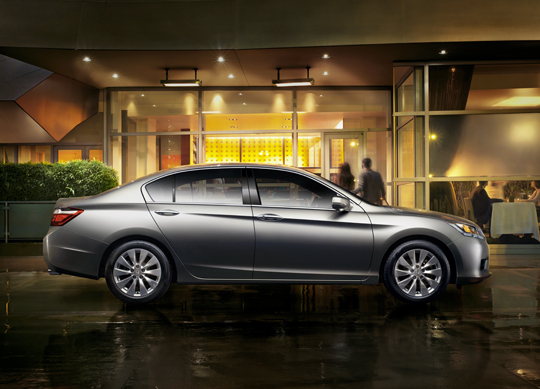 The 2013 Accord is the most-awarded3 mid-size car when it comes to value. "Honda continues to deliver on the promise that made them the Residual Value Award recipient for 2013," said Eric Lyman, vice president of Editorial for ALG. "Honda keeps incentives and fleet penetration low - two actions that heavily impact future values. With high volume models like Accord and CR-V at the top of their respective segments, Hondas hold their value better than any other brand." According to Honda analysis of Polk new-vehicle registration data, more than 19 percent1 of light-duty vehicle industry sales so far this year have been to non-retail customers such as rental-car companies, corporate and government fleet operations, most at steeply discounted prices compared to the average retail transaction price. Discounts on large volumes of vehicles can have a long-term negative impact on the residual or resale values of vehicles purchased at retail. This effectively increases the cost-of-ownership for retail buyers when they eventually sell or trade-in their vehicles. For big-time automotive fans, there are few things more enjoyable than getting a first look at a popular vehicle that has been given a complete redesign. Cars don’t get drastically new exterior looks every model year, so waiting for flashy new designs is something that requires a little patience. 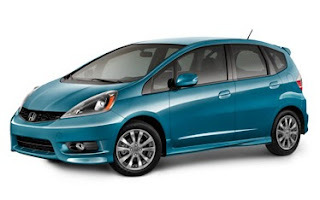 Well, in the case of an updated Honda Fit, patience is no longer required since Honda recently released images of what they say will be the design for the 2015 Honda Fit. End up at a place that you dream of. Autocar is reporting that Honda is about to start testing prototypes of its Micro Commuter, a petite EV that'll do adorable battle with the Renault Twizy if it reaches production. 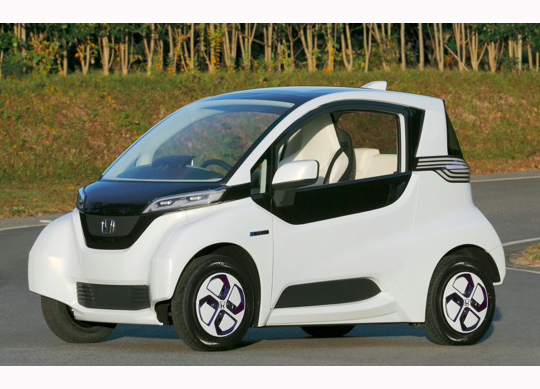 Honda first showed the Micro Commuter, a so called super-urban vehicle, in November. Like the Renault, it features a 1+1 setup, meaning there's a central seat up front and a small backseat behind it. Honda has designed the tandem runabout for versatility, featuring a body that can be adapted for everything from child hauling to elderly passengers. A rear-mounted electric motor draws power from a 15-kilowatt, lithium-ion battery, granting it a top speed of 50 miles per hour. With 37 miles of range, the Micro Commuter could be a neat urban solution. That said, these were figures that were announced in November, so we wouldn't be surprised to see them change as Honda gathers data from its new prototype testing program. 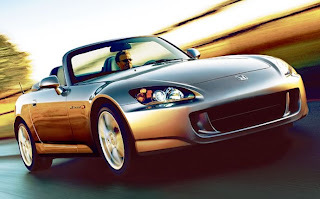 There are a lot of automotive customers that think to themselves, “You know, I would really like to purchase a sleek, sporty, powerful sports cars, but I simply cannot afford a really good one.” And you know, for the most part, we can appreciate that sentiment, even if it’s not particularly true. TV ads for the newest, most expensive sports cars make it hard for us to believe that we could afford something excellent for ourselves, but a recent list of 10 Sports Cars Under $10,000, which was put together by Popular Mechanics, proves that there are a number of great sports cars out there for a more than reasonable price. Psst! Remember late last month when we showed you those Japanese magazine scans purporting to show the next Honda Fit? The ones with the markedly more aggressive snout and Cuisinart-blade alloys? Yup, they were the real deal, but they weren't the standard model, they were images of the new Hybrid. We know this because Honda has just released a handful of images and some details on its forthcoming gas-electric hatchback, and the images line up perfectly. 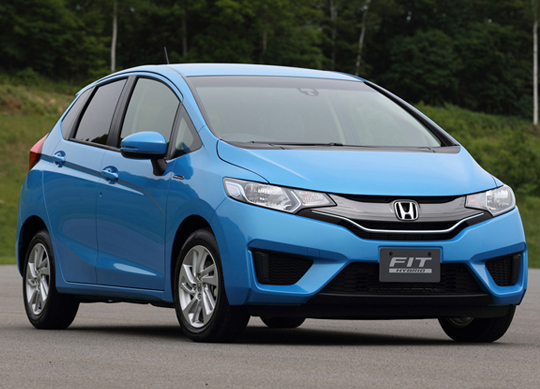 The big story for the third-generation Fit Hybrid will be the fuel economy, naturally. Honda says it has achieved economy ratings of 36.4 kilometers per liter – 86 miles per gallon – on its home-market cycle, highest among all hybrid models in Japan and a 35-percent improvement over the current Fit Hybrid, a model not sold in the US. Interestingly, the Fit brooms the company's underwhelming Integrated Motor Assist system in favor of a new single-motor e-assist system dubbed Sport Hybrid i-DCD, and it eschews a CVT like most hybrids in favor of a "dual clutch drive" (i-DCD) with seven speeds. The architecture can completely uncouple the 1.5-liter Atkinson cycle four-cylinder engine and the i-DCD's 22-kilowatt electric motor. The motor itself is backed by a lithium-ion battery that's integrated into the power unit, and Honda is also touting a new servo brake system and electric compressor that increases the efficacy of the regenerative braking while curbing engine load. The Fit Hybrid will be able to putter along at speeds of up to 31 mph in pure electric mode for 1.9 miles. 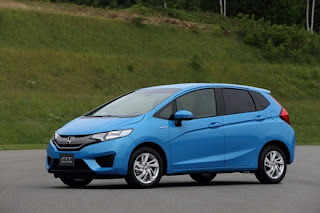 Automotive News reports that while the Fit Hybrid seen here isn't expected to be sold in the US, the technology will come to America in the form of a subcompact sedan and crossover based on the Fit's architecture, as early as next year. The conventionally powered five-door Fit will be built in North America for the first time, and should hit dealers in the third quarter of next year. Built in Honda's new Ceyala, Mexico plant, the US car is likely to be offered with a 1.5-liter direct-injection engine paired to a CVT, both new components in Honda's Earth Dreams arsenal. A 1.3-liter port-injected powerplant is also expected to be fitted elsewhere in the world. 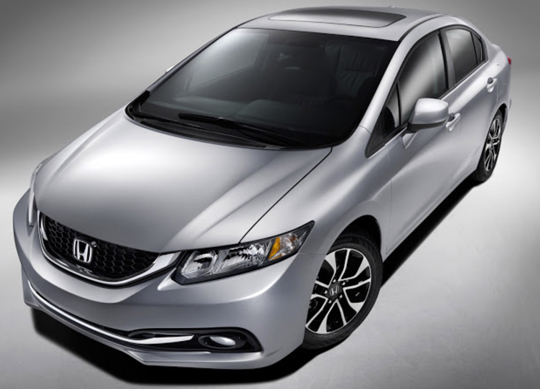 The 2013 Honda Accord and Civic were named to KBB.com's list of the 10 Best New Sedans Under $25,000. The Honda Accord was the top ranked vehicle on the list of new vehicles introduced in 2013 compiled by the auto experts at KBB.com. The Civic was the highest rated compact car on the list. "Nothing beats the value Accord and Civic offer customers" said Mike Accavitti, senior vice president of auto operations at American Honda. "Both models deliver on all fronts – value, performance, fuel efficiency, top safety ratings and a wide array of standard features – all at a competitive price point." As the top ranked model on the list, the Accord was recognized by the editors of KBB.com for its sophisticated styling, excellent driving performance and innovative features, like the available LaneWatch™ blind spot display. Additionally, Accord earns industry-leading safety scores, having been rated a TOP SAFETY PICK+ by the Insurance Institute for Highway Safety (IIHS) and distinguished by the National Highway Traffic Safety Administration (NHTSA) with a 5-star Overall Vehicle Score1. "While other mid-size cars have threatened its dominance, now we can definitively say that the Accord is back on top, with the completely overhauled 2013 model hitting No. 1 on our list of the '10 Best Sedans Under $25,000'," said Jack R. Nerad, executive editorial director for Kelley Blue Book's KBB.com. "The latest Honda Accord is as refined as any previous edition, but with a newfound sense of sporty style and cool new technologies that are as user-friendly as the car itself." The 2013 Honda Civic was the top rated compact car on the list. KBB.com applauded the Civic for its revised interior and exterior styling along with an impressive list of standard features, which includes rearview camera, Bluetooth™ connectivity and Pandora® internet radio capability. The Civic also earns industry-leading safety scores; having been the only compact car rated a TOP SAFETY PICK+ by the Insurance Institute for Highway Safety (IIHS) and distinguished by a National Highway Traffic Safety Administration (NHTSA) 5-star Overall Vehicle Score1. Once a year, J.D. Power & Associates conducts a study of which models are the most reliable over the course of the first three months of ownership, which to some consumers sounds a little ridiculous because why wouldn’t a new car behave itself for at least three months? But surprisingly, there are some automakers that really struggle with building cars that get through 90 days without reporting problems. Honda, however, is not one of these cars, as they were recently named among the top ten automakers in the industry in initial quality, with the 2013 Honda CR-V and 2013 Honda Civic each earning the top scores in their segments. With a month left before the start of the 2013 Honda Civic Tour, this year's trek has already sold more tickets than any other in the Civic Tour's history, with multiple sell-out venues. Upon achieving this milestone, Honda and Maroon 5 are giving fans a chance to win a customized and autographed Maroon 5 Honda Civic Si Coupe and Honda CBR250R motorcycle. Both the car and motorcycle were designed by the LA quintet with their signature color scheme, each making a clean yet bold statement. "The goal of the custom Civic and motorcycle was to capture the Maroon 5 iconography that expresses both the band's essence and live experience and channel it into a custom design," said frontman Adam Levine. Details on the custom Civic include a race-inspired exterior, Honda Factory Performance® body kit, Adam Levine and James Valentine signatures on the passenger door and a large "5" hood graphic. The Civic is outfitted with custom painted Honda Factory Performance® wheels that alternate between red and black. The sleek motorcycle design was born out of the GRAMMY-winning pop-rock outfit's collective imagination. With custom graphics and wheels, the motorcycle gives the impression that it's moving fast even while remaining still. Enter for your chance to win the Maroon 5 custom Civic by visiting Honda.us/M5Civic and the Maroon 5 custom CBR250R motorcycle by visiting Honda.us/M5Bike. Honda Civic Tour is also giving Maroon 5 fans a chance to attend two sold out Southern California concerts courtesy of Honda Financial Services. You can register for a chance to win the trip by visiting Honda.us/HFSGrad through Sunday, September 22, 2013 at 11:59pm ET. The prize includes round trip airfare for two, hotel accommodations in Anaheim and Los Angeles, two front row tickets to the Honda Civic Tour show at Verizon Wireless Amphitheater in Irvine on October 4th, two front row tickets to the final Civic Tour stop at the world famous Hollywood Bowl on October 6th, two theme park tickets, a sightseeing tour of Hollywood and Maroon 5 merchandise. For complete rules and restrictions, please visit Honda.us/M5Civic. The tour kicks off August 1st in St. Louis, MO with special guest Kelly Clarkson. Honda Factory Performance® body kit, including front, side and rear underbody spoilers. Custom painted Honda Factory Performance® 18-inch x 7-inch Diamond Cut Alloy wheels. Exterior painted in Maroon 5 signature colors of black, red and white. 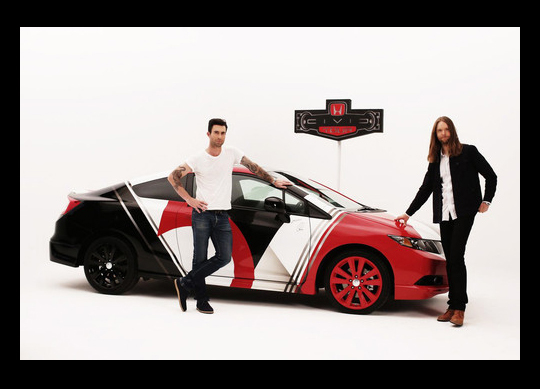 Adam Levine and James Valentine signatures on passenger side door. "Hands" Ad to Rival "The Cog" Video? In celebrating 65 years of innovative work, Honda continues to make a big splash in the ad world! The new Hands ad might just match up to the success of the 2003 "The Cog" video. Let us know what you think!! The 2014 Honda Odyssey Is In! Come down to Pacific Honda and test drive the all-new 2014 Honda Odyssey! Filled with tons of updates and new features, you will have to see it for yourself! It’s hard to put a dollar amount on “cool,” because as varying degrees of human beings have shown over the course of history, cool can be a $2 pair of jeans from a thrift store or a $200,000 sports car from Italy. If we are going the car route, however, one pretty fair number to put on “cool” is $18,000, at least in the eyes of Kelley Blue Book, who recently assembled a list of the coolest new cars under that dollar amount. Celebrate your independence by being you and driving what you want to drive. 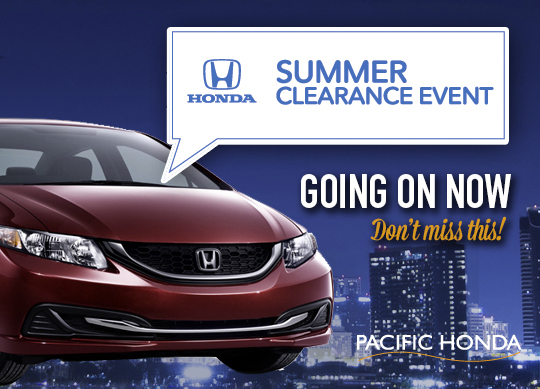 Pacific Honda has a new, massive inventory and can put you in the car that suits your lifestyle! 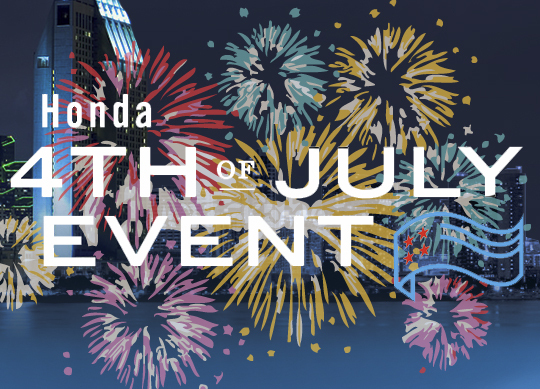 Check out the 4th of July Event going on now until July 7th, and visit us online at www.pacifichonda.com. In January, Ford, Daimler and Nissan announced they would all work together on fuel cell technology. Toyota is getting ready for its own 2015 fuel cell car. Hyundai is delivering H2 vehicles today. The Department of Energy has a plan called H2USA. Put all this together, and the future of the hydrogen vehicle is finally getting a little clearer. Especially with today's announcement that General Motors and Honda have signed a "long-term, definitive master agreement" that will co-develop next-generation fuel cell system and hydrogen storage technologies. The companies hope to have these new technologies in vehicles in around 2020. To be clear, this is not an announcement that the two OEMs will build a car together, just the hydrogen guts. The main reason for the collaboration – which follows the logic Nissan CEO Carlos Ghosn laid out a few months ago – is that fuel cell starts with cost disadvantages compared to gas vehicles (e.g. the cost of the pressurized tank is higher than a plastic gas tank and there are expensive precious metals in the fuel cell stack) and it will be easier to reduce these costs in partnership. On top of this, GM and Honda want to reduce costs in whatever shared components will be in the resulting vehicles. Since there was no actual car (or cars) announced, both companies declined questions on price targets for the resulting 2020 fuel cell model. Honda executive vice president Tetsuo Iwamura did say Honda hopes to make the vehicle "as affordable as possible." 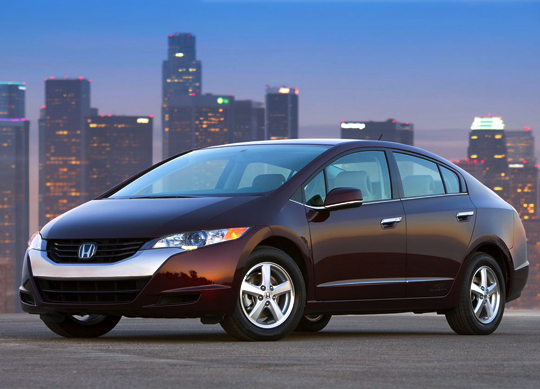 Currently, Honda leases the FCX Clarity (pictured) in California for $600 a month. GM, which has its own long history with hydrogen, said it has "a lot of respect" for what Honda has done with H2 technologies and the companies' technologies "complement each other," said GM vice chairman Steven Girsky. GM has put almost three million miles onto its fuel cell test fleet over the years, including with Project Driveway. The two companies will also be contributing to hydrogen infrastructure efforts, starting in the Golden State. There are about 10 H2 stations currently open in California, with plans to increase that to 25 or so in the next few years and then 100 stations beyond that. Both Honda and GM – and other automakers – are supporting this infrastructure growth and the beginnings of a hydrogen infrastructure are also in the works for Japan and Europe.